5 essential Skype interview tips that you should know. Skype interviews are becoming common practice. They help recruiters and companies to filter out candidates at an early stage and are inexpensive and relatively easy to conduct. Presenting yourself in the best manner during Skype interviews can be tricky and you need to be well prepared. Find out how to make the right impression from a distance. Check your Skype name - does it give the right impression? A professional sounding name is better than a jokey or cool name. Create a new Skype account for interviews if you want to keep your informal name for your friends. Download the latest version of Skype to ensure you are getting the best quality performance. Basic Skype interview tips stress testing all your equipment thoroughly and not just 5 minutes before the call! Make sure your Skype connection is working properly. Test your camera and microphone the day before the interview. Ensure your internet connection is good enough to handle the video call. A headset has a better sound quality than your computer so try and use one. Close all other programs and windows on your computer before you take the call. Receiving email notifications during your interview is unprofessional and distracting. Ensure that where you conduct your Skype interview is businesslike and free of distractions and interruptions. A neat and tidy room where you can close the door is best. Let others in the house know that you cannot be interrupted and to keep things quiet for you. Keep your windows closed if there is a possibility of distracting outside noises such as pets. Check what your environment looks like. If it is messy it can give the impression that you are a disorganized and untidy person. Look at the wall behind you and remove any distracting pictures or posters. Good Skype interview tips include keeping your surroundings as neutral as possible. Make sure your desk or table is uncluttered and you are able to easily access your documents and a pen and paper to take notes. A bright window or light behind you means you will appear as a dark silhouette. Light from above or below can create shadows on your face. Light should come from in front of you. Have natural light or a lamp aimed at your face from behind your screen. Carrying out a practice run with a friend really does help to make you feel more comfortable and confident. Candidates can feel very self-conscious during this type of interview. You can record the Skype interview and study how you come across and where you can improve. Ask for feedback on your performance. This mock interview is a great way to test your interview skills. The first impression you make during your Skype interview is key to setting the tone. Find out the dress code the company expects by doing some research beforehand. Make sure you dress appropriately and look smart and professional. It's tempting to wear sloppy sweatpants or short pants but it's far better to dress properly from head to toe. There are a number of instances where candidates have had to stand up to adjust equipment and have been caught out! Important Skype interview tips include dressing as though you were having a face to face interview. This creates the right mindset and improves your performance. Check your interview clothing is clean, properly pressed, has no buttons missing or tears or stains. Stripes, patterns and bright designs can make your clothing appear messy on the interviewer's screen. Keep it simple. Neutral, solid colors such as blues and greys look best on video. Avoid glittery or jangling jewelry that distracts the interviewer. You will be seen in detailed close-up so make sure your makeup is properly applied and your hair is clean and tidy. Choose a hairstyle that is off your face, constantly adjusting your hair is distracting. Understated makeup looks better on the screen than bright colors. Men should ensure that they are cleanly shaven or have neatly trimmed facial hair. 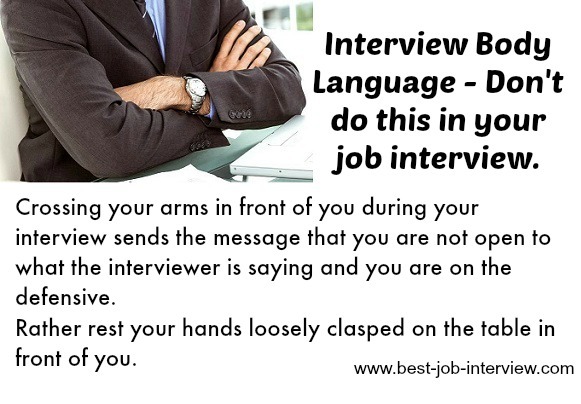 Look at your body language in your mock interview and check you are sending the right non-verbal signals. Good eye-contact, an upright posture, a sincere smile and using your hands properly all contribute to the right impression. ﻿Don't allow your eyes to wander around the room, keep focused and give the interviewer your full attention. Avoid looking down at your interview answers on a piece of paper, practice these beforehand so you are ready to respond in a natural and confident manner. Avoid focusing on the small image of yourself in the corner of the screen, you will spend the interview looking at yourself instead of the interviewer. You can use your settings to disable this image and prevent this happening. Look into the camera and not into the screen to make eye contact. If you look at your screen instead of the camera you will appear to be looking down at the interviewer. If you are using a laptop it may be better to elevate it on a couple of books so that the camera is at eye-level. Check the tone and pace of your voice, make sure you can be easily heard and understood. Speak clearly and confidently. Avoid talking too fast but convey enthusiasm for the job by showing energy in your voice. 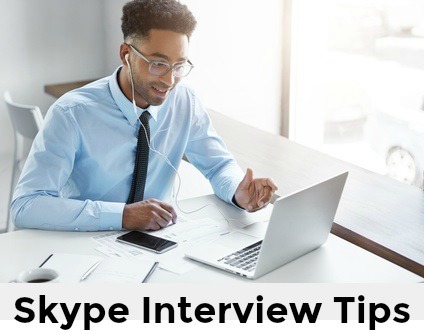 With some Skype connections there is a slight transmission delay with the picture, be aware of this and pause to make sure the interviewer has finished speaking before you answer. Make sure the connection is closed before doing or saying something after the interview. The rule of thumb is to treat the Skype interview as though you were in the same room as the interviewer. This will ensure that you perform to the best of your ability.